There’s something about re-creating egg dishes in vegan versions that’s fun to do and comforting to eat. 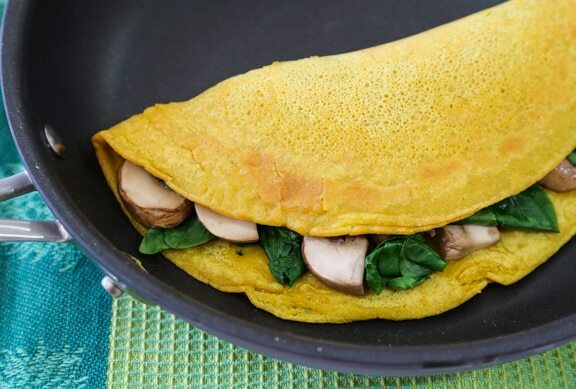 After going plant-based, we sometimes miss favorite foods, and these easy vegan chickpea flour omelets do the trick as a swap for their egg equivalents. While these omelets don’t taste exactly like eggs, they don’t have to —they’re tasty in their own right and do a fine job of enveloping your favorite veggies. They’re excellent for brunch, portable lunches in a flat container, and as a light dinner with fresh whole grain bread and a salad, or a baked potato. Use this basic recipe as a jumping off point. These are part art and part science, since there are a few variables — the size of the skillet, how firmly you pack the chickpea flour, how hot the skillet is. If you like this recipe enough to make it again and again, you’ll see that it becomes easier each time you make it! You’ll want to experiment with your own fillings, toppings, herbs, and seasonings. 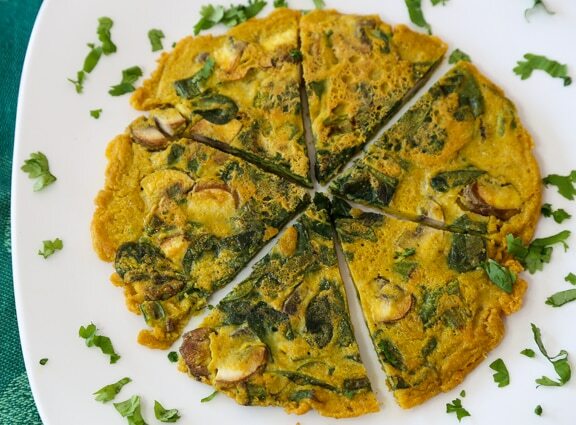 This formula adapts to frittata style easily. 2 In a mixing bowl, combine the flour, nutritional yeast, baking powder, turmeric, salt, and optional mustard. Stir together until completely combined. 3 Make a well in the center and pour in the nondairy milk, water, and oil. Whisk together until completely smooth. If the mixture is too thick, add just a little more water; it should have the consistency of pancake batter. 4 Heat enough olive oil to coat the bottom of a nonstick omelet-sized pan (8 to 10 inch). Let it get nice and hot, enough to make a drop of the batter sizzle. 5 Omelet: Ladle the batter 3/4 cupful at a time for 10-inch skillets or 1/2 cupful for 8-inch skillet. Tip the pan so that the batter extends to the edges. Cook over medium heat until the top firms up and the underside is golden. Don’t overcook, which would make the omelet crack when you fold it. Flip and cook the other side, then fill with your prepared vegetables and fold over. Frittata: Stir 1 to 1 /2 cups of prepared veggies (see first note, below) into the batter. Ladle about 1 1/2 cup’s worth of this mixture into the oiled and heated 10-inch pan; about 1 cup’s worth into an 8-inch pan. Cook over medium heat until the top firms up and the underside is golden-brown. Flip and cook the other side. Repeat with the remainder, then serve at once with optional salsa or hot sauce. Vegetable fillings: Prepare whatever you’d like to go into your omelet first. We love a spinach-mushroom-scallion combo, shown here. 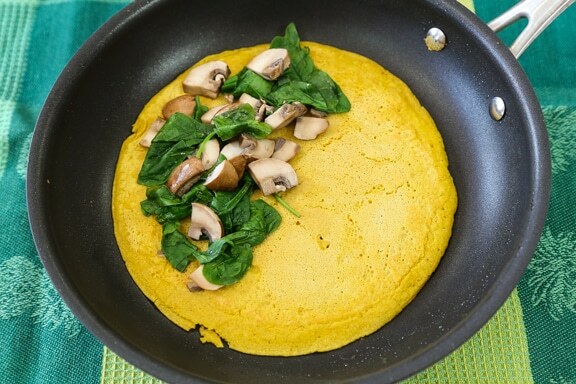 Just wilt down the spinach and mushrooms down in a little water (you can use the same skillet you’ll be using for the omelets), then drain well and set aside. Each omelet can hold about 1/2 cup of vegetables. Other good fillings for omelets include lightly steamed asparagus, broccoli, and/or zucchini; sautéed onions and/or bell peppers; and sliced tomatoes (these need not be precooked). Fresh herbs: Use to your heart’s content. Parsley, cilantro, dill, scallions, chives, fresh oregano — they’re all good. About chickpea flour: This kind of flour is sometimes labeled garbanzo flour, as Bob’s Red Mill does; it’s also sometimes packaged as gram flour or besan. Kala namak, or black salt: Actually a brownish-pink Himalayan salt), it helps add an egg-like flavor and aroma to dishes. Nondairy cheese: It’s not in the recipe above but you can also add a sprinkling of nondairy cheese shreds for an extra measure of yum! The baking powder was left out of the ingredient list. How much do you need? Sorry, Brittany — that would be 1 teaspoon. I will amend the recipe! I’ve made this twice now and it’s just delicious! It’s my new favorite. I love how I can use up whatever veggies I have in the fridge. Last time I used mushrooms, broccoli and asparagus then topped it with chopped tomatoes on the plate. A little bit of hot sauce on the side and yum! Thanks so much! Thanks, Terri! So glad you enjoy this.